Amazon.com description: Product Description: No library's complete without the classics! 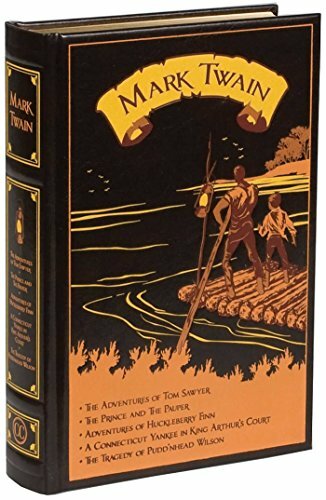 This new, enhanced leather-bound edition collects some of the most popular works of legendary humorist and novelist Mark Twain. Mark Twain wrote his greatest works more than one hundred years ago, but he's never far from the minds of Americans. Whether it's the new, complete, and uncensored version of his autobiography hitting bestseller lists or the removal of certain controversial language from one of his novels, his name and his legacy remain a topic of conversation--and undoubtedly will for years to come. There's no better time to appreciate his stories, or read them for the very first time. The Adventures of Tom Sawyer, The Prince and the Pauper, Adventures of Huckleberry Finn, A Connecticut Yankee in King Arthur's Court, and The Tragedy of Pudd'nhead Wilson are collected in this timeless and elegant book. Part of the Canterbury Classics series, Mark Twain features a beautiful cover, a ribbon bookmark, and other elements to enhance the reading experience, along with an introduction by a renowned Twain scholar that will enlighten new and familiar readers alike. This edition of Mark Twain is a treasure to enjoy forever--just like the writing of Twain himself! About: No library's complete without the classics!